Using the best motorcycle hitch carrier means making sure you load and transport your bike easily and safely whenever needed. If you’re on the lookout for the best hitch mount motorcycle carrier yet you are time-poor, this guide might be of assistance. After carefully examining various options of motorcycle hitch carriers available for sale, we have reached the conclusion that the Goplus 600 LBS is the first option you should consider. The durable and solid construction will help you carry your bike firmly. Thanks to the steel build, you can use the product for bikes of up to 600 lbs. Plus, the two quick release locks will help you fasten your motorcycle easily while providing a secure transport. In the unfortunate event that this item is no longer available, you might want to consider the Best Choice SKY1375 as a reliable alternative in terms of quality. If you need a sturdy hitch carrier that fits heavy motorcycles, this product from Goplus should be on your shopping list. It is durable and will allow you to transport bikes as heavy as 600 pounds. The item is made of high-quality steel that provides increased strength and toughness, meaning a secured transportation. The steel is resistant to corrosion so it will last for many years. The manufacturer doesn’t recommend using the carrier with a load at more than 45 mph, meaning you should stay off the highway. We liked the sturdy construction and the quality of the materials used for manufacturing this hitch carrier. The item is designed to safely transport your dirt bike, motorcycle or scooter anywhere you want. It comes with a heavy-duty steel frame that provides increased strength, durability, and reliability. The attached ramp allows you to easily load your vehicle on the carrier without lifting it. Also, it can be loaded from either side, which makes it even more convenient to use. The maximum supported weight is 500 pounds, so we don’t advise you to carry very heavy bikes or other types of vehicles. Most customers praised the utility and sturdiness of this carrier, so you might also want to give it a try. The sturdy steel frame and the quality powder-coated finish make this product not only reliable but also resistant in time. You can use it in all weather conditions to safely transport your motorbike, dirt bike or scooter. We also liked the anti-tilt lock bracket that will secure your vehicle and prevent it from moving during transportation. It is designed to fit class III or IV hitches. Some customers complained about the poor instructions that are hard to decipher by inexperienced users. Designed to last in time, the new VersaHaul could prove the winning choice for those who need a secure hitch. Since there are many motorcycle hitch carriers on the market, finding the right one for your bike might take lots of your time. To ease your shopping and help you find a good motorcycle hitch carrier, we have listed below a few reviews of motorcycle hitch carriers based on customer feedback, ratings, and specs. If your motorcycle falls into the heavy category and you’re looking for a hitch carrier that comes with a large load-bearing capacity, the 600 LBS model from Goplus is the first product you should bear in mind. Sporting a durable and solid construction, the hitch carrier will enable you to load and transport bikes of up to 600 lbs. Thanks to the steel used, the product offers good toughness and high strength, which further translates into a secure and firm transportation. Moreover, the steel is corrosion-resistant and that means your rack won’t rust when it rains. The 72″ long loading ramp is stored right on the carrier. The two quick release locks will help you secure the ramp when loading it making sure your bike transportation is safe. The wheel stop is adjustable and the black powder coat finish durable enough to ensure extended use. 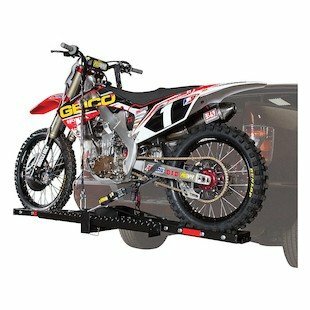 Another option you might want to check before making a decision is the SKY1375 Steel Anti-Tilt Motorcycle Hitch Mount Carrier from Best Choice Products. Designed to help you transport your motorcycle, scooter, or dirt bike safely, this model sports a heavy-duty steel frame that ensures durability, reliability, and strength. Thanks to its design and the ramp it comes with, it is easy to load your motorcycle on the carrier. The item is made for a 2″ square receiver and offers the multi-load feature, which means it can be loaded from either side. 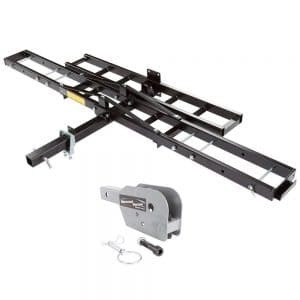 Providing a loading capacity of 500 lbs, the product can be easily assembled. 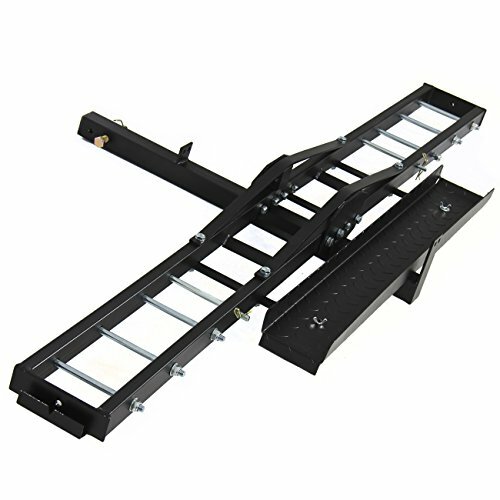 The loading ramp is 38.5″ in length and 4.75″ in width whereas the main hitch tube has a length of 18″. Most customers who tried this product to transport their bikes have appreciated it for its overall quality, durability, and solid build. 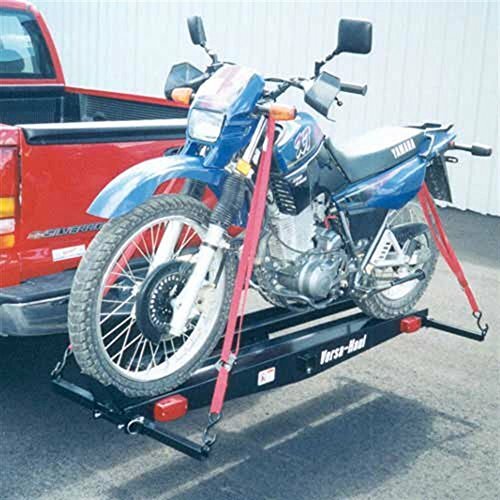 Designed with high-precision techniques, the Dirt Bike Hitch Carrier With Ramp from VersaHaul is another option to keep in mind if quality, durability, and a large loading capacity are the features you want from your next motorcycle hitch carrier. A high-quality powder paint coating has been used to offer protection against elements and durable steel to ensure durability and strength. Providing a carrying capacity of 500 lbs, this model is worth considering if you’re the owner of a heavy bike. The anti-tilt lock bracket included will provide additional stability and eliminate any movement. The superior design will further eliminate movements that might affect your bike when transporting it and, thus, decrease the risk of twisting and bending. The adjustable wheel stops will also deliver great stability even when transporting smaller bikes. 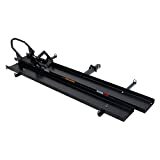 The carrier rail has a length of 71.5 inches and a width of 6.37 inches. There are various models from VersaHaul you should check before deciding which one to go for. 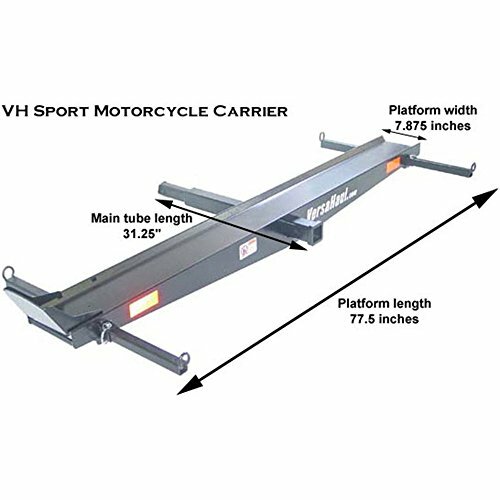 The VH-SPORTRO Sport Bike Carrier with Ramp is another product you might want to keep in mind when looking for a new hitch carrier for your bike. 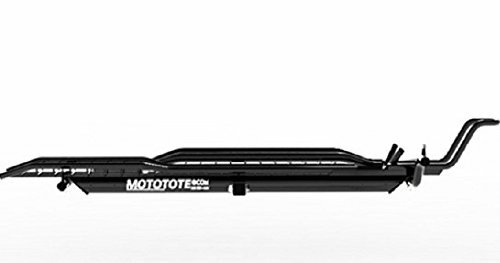 Manufactured with high-precision techniques, this product is committed to delivering durability, strength, and reliability whenever you need to safely load and transport your motorcycle or scooter. The item is designed to carry 600 lbs. You can use the VersaHaul calculator to determine if your motorcycle will fit on this carrier. Increased stability is ensured by the anti-tilt lock bracket that will eliminate any movement that could damage your bike during transportation. The item comes with four retractable tie-down bars and includes the ramp option. Plus, this model sports a Class III hitch on the end of the carrier and thanks to its dimensions it can handle wide motorcycle tires. 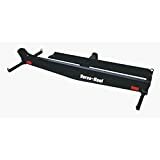 If you’re planning to explore new places this year and you need a new hitch carrier for your bike, another product you should check is the Sport Bike Hitch Rack Ramp from Moto Tote. 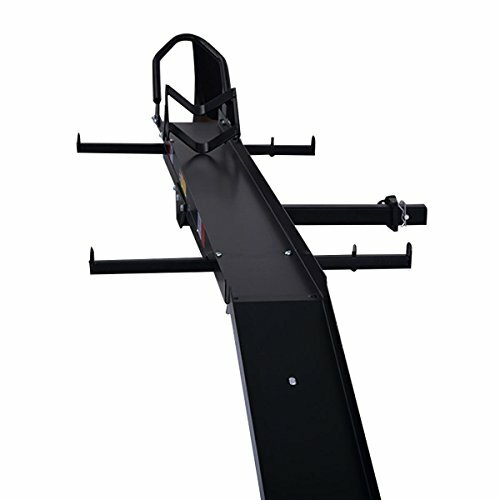 Designed for street and sport bikes of up to 550 lbs, this model has been manufactured with advanced techniques in order to provide customers with a quality and durable construction. The package includes a loading ramp that boasts the same premium quality as the rest of the unit. The product is designed in such a way to make sure the bike gets no damage during transportation. Thus, the tail end of the tire track is rounded in order for the fairings to stay safe. A good traction for loading is possible thanks to the advanced formed tube and wire construction. You can adjust the item for wheelbases of up to 65 inches. The carrier is easy to assemble requiring minimal tools. Make sure you also check the VH-55DMRO carrier from VersaHaul before you decide what model to choose this year. This item will not only provide you with increased durability and bike stability during transportation but also with an easy-to-use design. Made of sturdy, 14 gauge steel, this motorcycle hitch carrier is designed to last and keep up with heavy bikes and extended use. Due to the anti-tilt lock bracket the product comes with, stability is increased and unwanted movements are eliminated. The high-quality of this model is further enhanced by the powder paint coating that delivers protection against harmful elements. The product was manufactured with high-precision techniques and designed to safely carry a total load of 600 lbs. However, its loading capacity is limited to only 500 lbs per carrier rail. The item features four retractable tie-down bars and fits any class III or IV hitch. 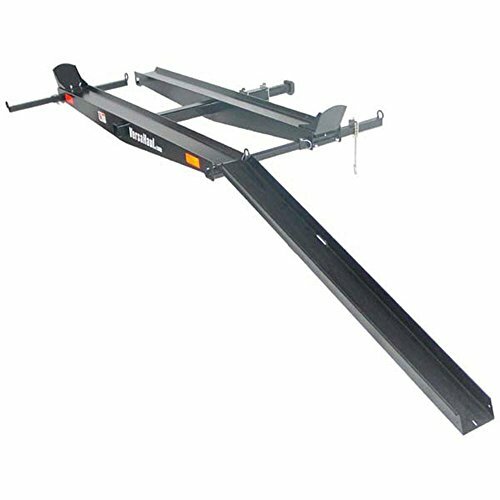 In case you need a quality and sturdy hitch carrier for a motorcycle of up to 500 lbs, the Folding Hitch Hitch Motorcycle Carrier Heavy Duty Rack with Ramp from Black Widow might be just what you need. Designed to safely transport dirt bikes with tires of up to 7″ wide, the product doesn’t just keep your friend-on-wheels safe when on the go but it is also easy to assemble and install. The item works with 2″ Class III or IV trailer hitch receivers and comes with the necessary hitch pin. Featuring a folding hitch adapter to ensure upright storage, the product sports a heavy-duty steel construction as well as a black paint finish for durability. The solid steel frame connects into a trailer hitch for hauling, which means that you won’t need a full-size trailer to move a single bike. The carrier measures 45.5 inches in length and 6.9 inches in width. You want your motorcycle to reach your desired destination safely and so does this Motorcycle Carrier from Trackside. Designed to make bike transportation easy and safe, this model comes with features that you might want to consider before hitting the button order. The powder-coated steel construction ensures the needed strength and durability to carry bikes of up to 500 lbs with a maximum tire width of 4.75 inches. You can adjust the front tire placement by simply moving the wheel track carrier bolts. It boasts a multi-load design, which means you can load it from either side. The anti-tilt device it features will eliminate excessive movement and, thus, keep your bike stable during transportation. The included ramp can be attached to the carrier for both transportation and storage. It can be used with a Class III or Class IV trailer hitch only. According to some customers, it can also be used with scooters. 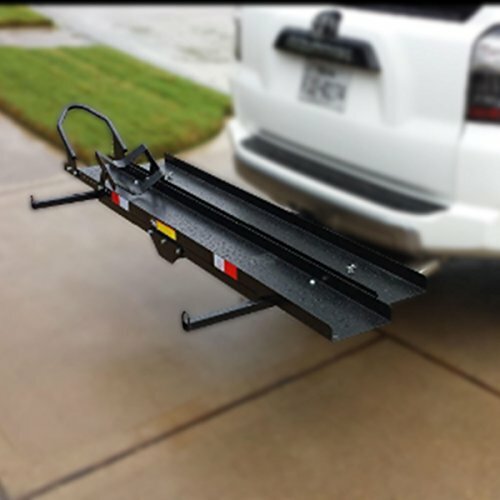 There’s still one more product that shouldn’t go unchecked when looking for a hitch carrier to help you load and transport your bike easily and safely. 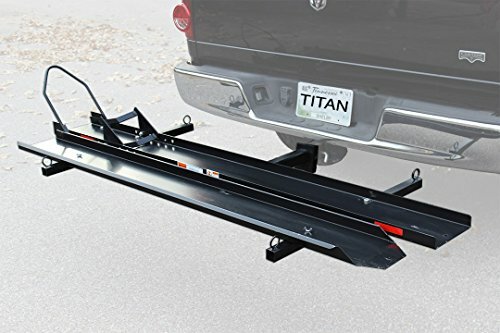 The Hitch Hauler from Titan Ramps is committed to offering durability, stability, and ease of use thanks to its sturdy yet lightweight construction. This all-in-one solution will allow you to securely haul and transport a great variety of bikes. Using it involves no difficult steps. You just need to attach the carrier and roll your bike onto it with the supplied mountable ramp. Thanks to the integrated cradle wheel chock, you will be able to center your motorcycle with ease. Due to the steel build, the product can carry bikes of 600 lbs. 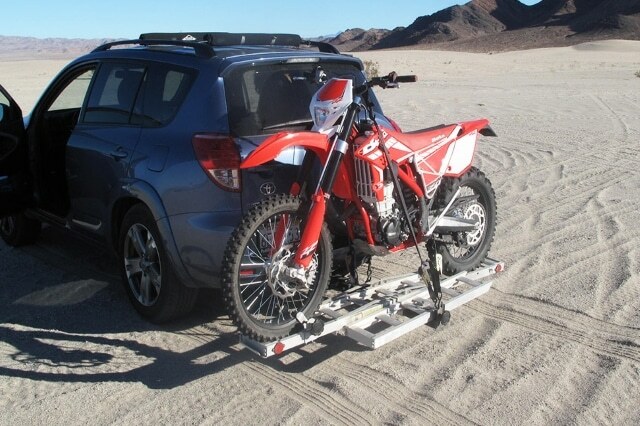 The tow hitch motorcycle rack fits a 2-inch receiver and is easy to assemble. It measures 72 inches in length and 7.5 inches in width with a track length of 78.75 inches. Carrying your motorcycle to some new place you want to explore on two wheels might prove to be a challenging task. Hauling and transporting your bike will be way easier if you use the right motorcycle hitch carrier, though. In order to be sure that you choose the one that best suits your needs, even if your budget limits you to a cheap motorcycle hitch carrier, there are some features you need to consider. Keeping them in mind when shopping will help you make sure you will get a carrier that won’t break during transportation and that will safely get your bike to the desired destination. The material a carrier is made of counts considerably when it comes to durability and safety. The most popular materials used for carriers are usually steel and aluminum. Such materials are preferred due to their durability and strength and both of them come with ups and downs. Steel hitches tend to be heavier and clunky. However, they feature increased durability and they are reliable even when transporting heavy bikes. Therefore, if you have a heavy motorcycle, you might want to consider a carrier that is made of steel. Aluminum carriers might be fragile for heavy bikes and severe pressure. The upside of such products, though, is that they are lightweight and easy to install. Moreover, they feature increased resistance to corrosion, which means you won’t have to worry about transporting your bike when it rains or the weather gets a bit rough. One of the most important things to pay attention to when looking for a new hitch carrier for your bike is the weight capacity it provides. You might shop the best rated motorcycle hitch carrier but if it does not support the weight of your motorcycle, it is useless. Therefore, consider your bike weight as well as the weight capacity of the vehicle you intend to use when transporting the motorcycle. Both of them are of utmost importance. Trying to transport your two-wheeler with a carrier that is not suited for its weight might end up in it breaking down and causing all sorts of damages. Here’s where the type of the materials used for the hitch carriers counts. If your bike is heavy, it is recommended for a steel construction for extra strength and durability. Durability is what most bikers are interested in when looking for a hitch carrier. It seems that the hitch mount carriers are doing great at this. In this case, the hitch mount is attached at the back of the car you use to transport your bike. Since they come in a variety of sizes and weight ratings, it is best to check the manual of your vehicle to learn more about its hitch class. Just like when you’re looking for a new motorcycle battery or a quality motorcycle exhaust system, there are various models that go better with certain bikes. Once you know the hitch class, you will have the possibility to make a more informed decision. There are some motorcycle accessories and parts that must be chosen based on the level of safety they provide. Safety is your number one concern when looking for a hitch carrier, just like when you’re looking for a full face motorcycle helmet, a new motorcycle chain, or a pair of quality motorcycle goggles. Opt for a product that won’t break or allow movements that could damage your bike during transportation. Then, go for a model that is easy to assemble and that comes with a loading ramp that can be attached to easily load your bike. If you’ve found this guide useful, you might want to check some of our other posts to learn more about dirt bike and motocross helmets to keep you safe, noteworthy motorcycle battery chargers, or the motorcycle tank bag that best suits your needs.